This book, the latest in the “Sync” series, is the long-awaited follow-up to The Out-of-Sync Child. 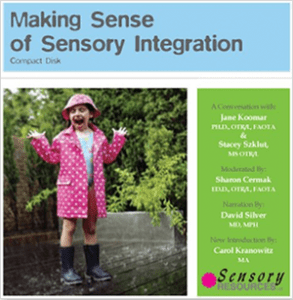 It offers practical advice for coping with Sensory Processing Disorder in the tween, teen, and young adult years. As a generation of kids with SPD enters young adulthood, this guide will help them and their families navigate the world that seems too loud, bright, fast, close, or otherwise overwhelming and confusing to the senses.